A few months ago, I was talking with a Chinese history professor here and somehow came to mention the name Lei Feng in passing. “You know Lei Feng?! ?” he exclaimed, laughing. Well, any China history nerd worth her salt knows Lei Feng, “the yeti of Chinese Communist history,” whose brief life became fodder for one of the most amusing propaganda campaigns in Mao’s China. 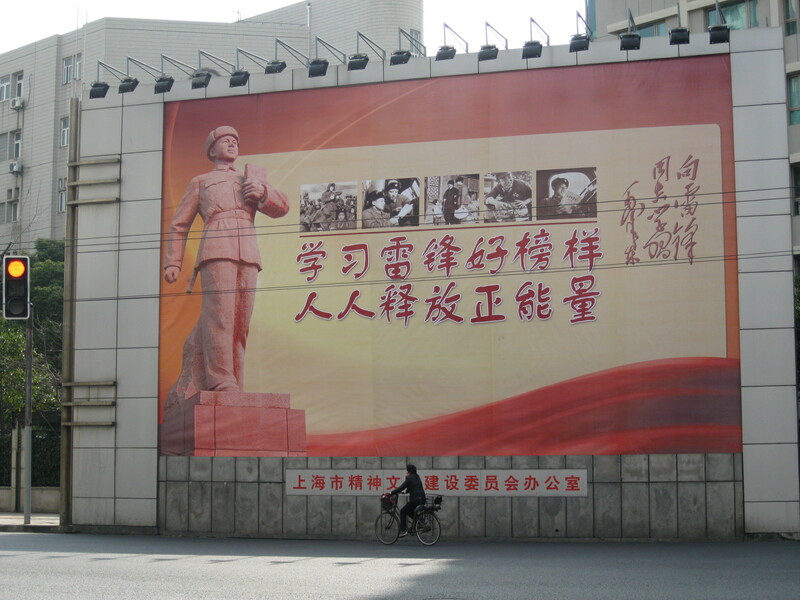 (I wrote a short history of the Learn from Lei Feng movement last year, and Jeremiah Jenne also offers a quick recap at his Jottings from the Granite Studio blog.) But even today, Lei Feng is a presence in propaganda posters that encourage people to follow his good example and strive for self-improvement. What’s interesting (to a China history nerd, that is) is that the hackneyed old “Lei Feng spirit” line has now been joined by Xi Jinping’s propaganda slogan, which celebrates “Our Chinese Dream.” What’s the Chinese Dream? No one exactly knows, but a lot of ink has been spilled trying to figure it out. (For starters: the Guardian, BBC, the Economist) In its broadest form, the Chinese Dream seems to be that the country will grow prosperous and strong—so, really, not all that different from the dream of any other country. Lei Feng is ripe for mockery, an anachronism from the days when Americans were telling girls not to appear too smart lest they scare away prospective husbands. But merging Learn from Lei Feng with the Chinese Dream also highlights the hollowness of the latter in light of the former. Earnest Lei Feng encouraged people to help each other out and serve the common good, to perform small acts of everyday kindness and improve society. The CCP has held on to that element of his story, while dropping the part where everything he did was in service to Mao and the revolution. How, though, does one support the Chinese Dream? There’s no clear path, beyond working hard to make China stronger. Xi Jinping has proven more charismatic and more PR savvy than his predecessors—though admittedly, the bar was set pretty low by robot-like Hu Jintao. In the area of sloganeering, however, “Chinese Dream” is scant improvement over “Three Represents” (whatever that means) and “Scientific Development.” “Learn from Lei Feng” is concrete and direct; it provides a model and a direct action plan. As funny as Lei Feng’s story seems today, the fact that the CCP continues to fall back on the Learn from Lei Feng campaign suggests that it hasn’t come up with anything better—and the party knows that. In the end, I’m not sure how much anyone is paying attention to either of these campaigns (anyone besides foreign China-watchers, that is). 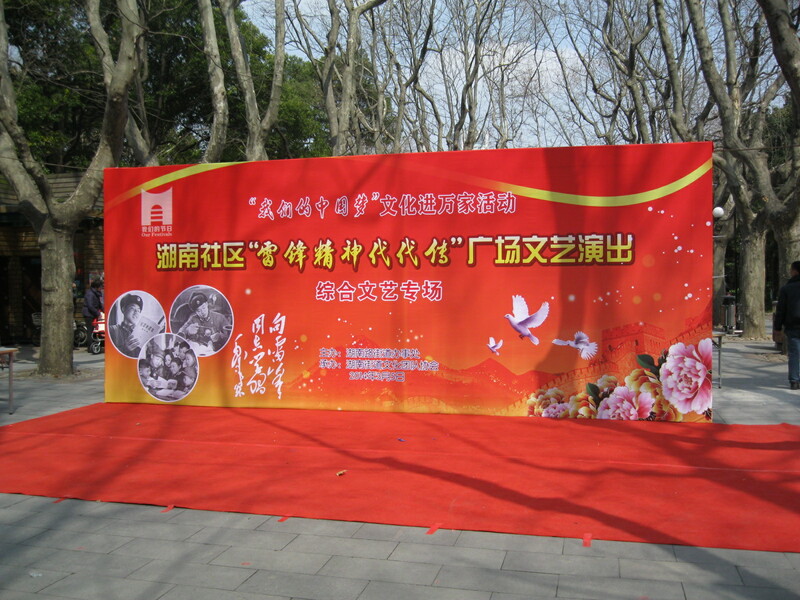 Some people have to participate when their work units are directed to stage events in support of the Chinese Dream. And the senior citizens milling around Xiangyang Park yesterday morning probably would have been there regardless of whether or not the Learn from Lei Feng Day performance was staged. 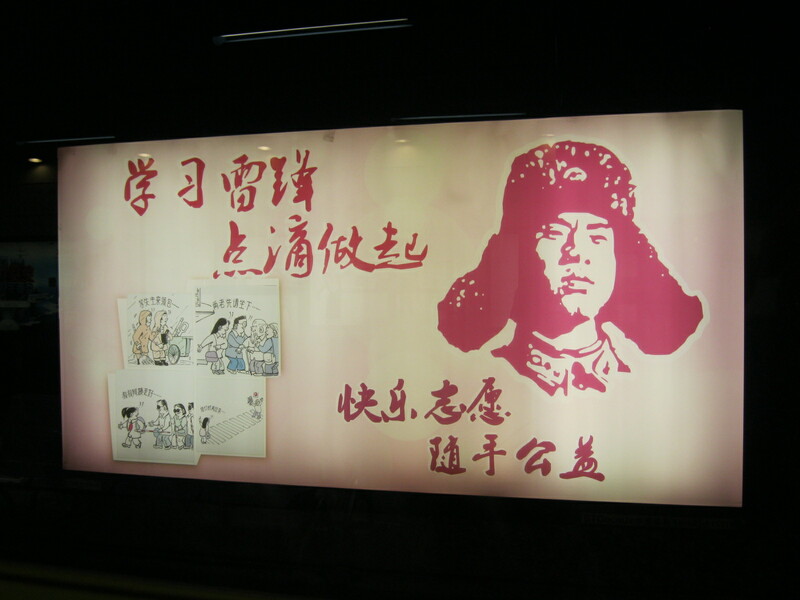 The CCP, however, would like people to take these campaigns to heart, and the fact that the party is promoting Learn from Lei Feng and the Chinese Dream is more interesting (and probably more important) than how the public responds to those slogans. It offers us insight into what the CCP is trying to achieve, even if the execution is often clumsy and a reminder that when it comes to propaganda, they just don’t make it like they used to. Previous Previous post: It’s Shanghai Litfest Time Again!